Welcome to the third part of our summer series that is helping educate Buckeye fans on potential top targets for Ohio State in its 2015 recruiting class. Last week we talked to Cincinnati (OH) St. Xavier linebacker Justin Hilliard, who is considered to be the top player in Ohio according to the only set of 2015 recruiting ratings that have been released to this date. 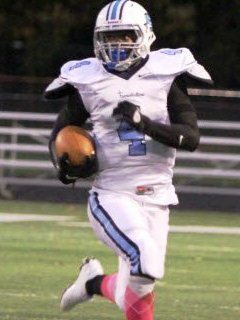 We're staying in the state of Ohio this week with Cleveland (OH) Benedictine athlete Jerome Baker, who is considered to be Ohio's second best junior. The 6-foot-1, 205-pound athlete could end up on either side of the field once he reaches the college level. The position he plays in college will highly depend on how much he grows over the next two years. The Benedictine product is very happy with the progress of his recruitment to this date. "I've gotten a lot of offers, that's where it all started. I have 15 offers right now," Baker told Eleven Warriors. "I'm not really leaning towards any schools right now. A few schools have really surprised me." Many of the nation's top juniors attended multiple football camps this fall. This was not the case for Baker. "I didn't go to many camps this summer. 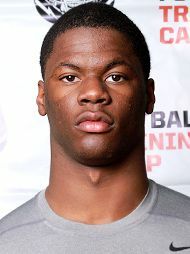 I only went to the NFTC camp in DC and a Rivals camp," he said. "I'm planning on being at Ohio State's Friday Night Lights camp later this month." Baker visited Ohio State in May and came away very impressed by the top football program in his home state. "It was my first time at OSU since the seventh grade," he said. "I used to think the school was too big for me, but on my visit in didn't come across as too big. I learned a lot on the visit. It was a fun experience. It felt like a family atmosphere, which I really liked." Baker's other recent visit was a trip to Happy Valley to take in Penn State's spring game. He really liked what Penn State had to offer. "It was a game situation, it was a lot of fun watching the scrimmage," Baker said. "It was a great atmosphere, and it was great getting to spend some time with the coaches." Both the Buckeyes and Nittany Lions hold a special place in Baker's heart. "I grew up rooting for the Buckeyes, until about the seventh grade when I went to a Penn State game and loved it," he said. "Ever since then I've followed Penn State and Ohio State the whole way." He also made it clear the Penn State's sanctions will not have an impact on his college decision. "No, not at all, it won't have any impact on my decision," he said. "I just want to play football. Every school makes mistakes, and I'll look past it. I was really just more hurt as a fan of the team because it hurt the football program." Offers from these two schools meant a lot to the junior. "Ohio State was my first offer, so it really shocked me. I didn't believe it, honestly," he continued. "It felt amazing. All the hard work you put in and the team you grew up rooting for offers you. It was just amazing, honestly. It felt like all of the hard work was paying off." "The Penn State offer was more of an achievement since I was rooting for them more than Ohio State at one point," he said. "I can know pick which one I like the most because both have offered." While he's not quite ready to name a top group of schools, he admits Ohio State and Penn State hold the upper hand at this point in his recruitment. "Yeah they do, those are the big ones," Baker told Eleven Warriors. "They have the upper hand because I grew up rooting for them." Baker has already built pretty strong relationships with the Ohio State coaching staff. "I talk to Coach Drayton a lot. I've also talked to coach Meyer a couple times. Coach Fickell is another coach I've been talking to." Ohio State running backs coach Stan Drayton is Baker's main contact on the Ohio State coaching staff. The two have already hit it off and have a strong relationship. "We have a great relationship. I haven't had the chance to talk to him recently because of issues with my phone, but he just wants me to keep improving," he said. "He knows what I'm going through. He gives me good advice, but doesn't pressure me. I just like talking to him. He's just a great coach to sit down and talk to." Buckeye head coach Urban Meyer made a very good first impression on Baker. "The first time I talked to him was so funny," he continued. "After school my coach called me and told me that Coach Meyer wanted to talk to me. So I called him and he immediately nicknamed me 'Dr. J.' Then he told me how he grew up in Ohio. It was a great way to start the relationship." "When I met him on the visit, I really saw a part of his life," he said. "He's really serious about football. He's a great coach." While a couple of 2015 prospects such as Eric Glover-Williams are closing in on a college decision, Baker is not anywhere close to choosing a school. "I'm about 90% sure that I'll decide on National Signing Day my senior season," Baker said. "My family told me to enjoy every single minute of the recruiting process." When he sits down to make a decision, three main factors will be taken into consideration. "Tradition, academics, and environment," he said. "The tradition: is it great? bad? Does the school have a strong alumni backing? Then academics are the most important factor. My dad has always talked to me about the importance of a good education. Then the environment. Do I like the school?" Baker would like to visit Ohio State, Michigan, Michigan State and Tennessee this fall.